SEONGNAM, South Korea, Nov. 1 (Yonhap) — Police said Thursday they have registered a criminal case against Gyeonggi Province Gov. Lee Jae-myung on multiple charges against him. Bundang Police Precinct in Seongnam, just south of Seoul, said it has booked the governor for allegedly abusing his power, spreading false information and violating the election law. The police then sent the case to the prosecution for further investigation with an opinion that he should be indicted on those charges. The influential politician has long been dogged by allegations that he abused his power when serving as Seongnam mayor to force his older brother, now deceased, into a mental hospital, and that he violated the election law by denying the suspicion. 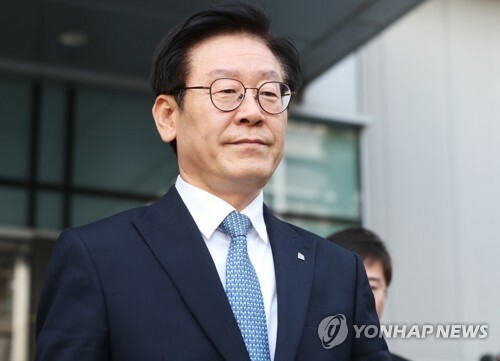 He is also suspected of spreading false information about his criminal record and a local land development project when he was running for Gyeonggi governor in June.